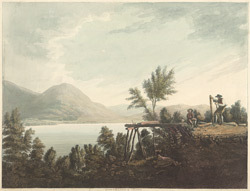 View of Bassenthwaite Lake in Cumbria. The lake is one of the largest of the lakes in Northern England at four miles in length and three quarters of a mile in width. It is actually one of the shallowest lakes at only seventy feet. Lord Alfred Tenneyson stayed in a house overlooking Bassenthwaite lake and it is thought that it was the inspiration for the lake which features in his poem ‘Morte D’Arthur’- the sword Excaliber being thrown into its waters.